Rank based on 2007 feegurs. 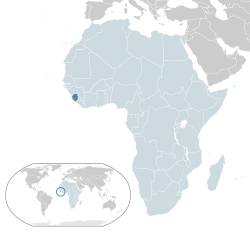 Sierra Leone (Krio: Sa Lone), offeecially the Republic o Sierra Leone, is a kintra in wast Africae. It is bordered bi Guinea tae the north an east, Liberie tae the sootheast, an the Atlantic Ocean tae the wast an soothwast. Sierra Leone covers a total aurie o 71,740 km2 (27,699 sq mi) an haes a population estimatit at 6.5 million. ↑ "The World Factbook". www.cia.gov. Retrieved 7 October 2015. ↑ 3.0 3.1 3.2 3.3 "Sierra Leone". International Monetary Fund. Retrieved 18 April 2013. Wikimedia Commons haes media relatit tae Sierra Leone. This page wis last eeditit on 27 Julie 2018, at 16:36.